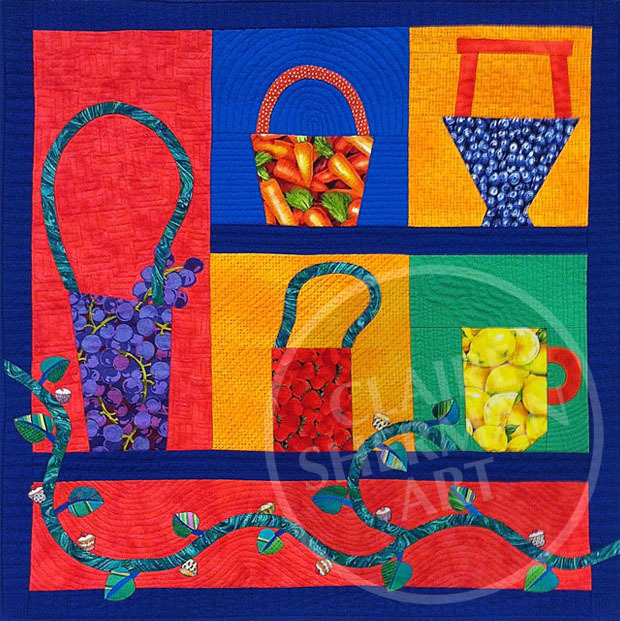 For my first blog post, I chose a quilt I finished in 2014, called Baskets and Hot Lemonade. My younger daughter, Shira, has frequently encouraged me to buy food themed fabrics. I thought I was buying them for her. However, since she didn’t make anything out of them, I made a quilt with the food themed fabric for her bed. I’ll blog about that quilt some other time. Meanwhile, I still had lots of fabric left, so I experimented with food themed baskets. I made these basket blocks as samples of different ways to make handles for a “liberated basket” demo for the East Bay Heritage Quilters, Thursday night meet-up group. There is a pieced handle, a fused, and satin stitched handle, and handles made from bias-cut fabric, appliquéd by machine. Although I’m calling them baskets, the lemon fabric turned into a cup of lemonade. (Hot lemonade with honey is our family remedy for a sore throat). Carrying on with the food theme, the vine at the bottom is sprouting cupcakes rather than flowers or berries. I appliquéd the leaves and cupcakes with fusible-web, and zigzagged the edges with monofilament. I did the quilting with a walking foot. I learned how to make these “liberated baskets” from Gwen Marston’s book, Liberated Quiltmaking II. Of all the quilters I’ve learned from, over the years, Gwen has had the biggest influence on me. Therefore it’s fitting that I mention her and one of her wonderful books in my first blog post. This entry was posted in Liberated basket, Uncategorized and tagged East Bay Heritage Quilters, Gwen Marston, liberated basket. Bookmark the permalink.